You are here: Home / Alkaline Water / Should You Buy Bottled Alkaline Water? Thousands if not millions of dollars are being spent to unsuspecting consumers, who in turn spend thousands themselves for these bottled “super” waters. So, should you buy bottled alkaline water or not? The answer to this question is no. Don’t believe the marketing gimmicks. Here’s why. First, while bottled water makers say their brand of water is pure, they still put it in plastic bottles that release chemicals from the plastic into the water. Especially when they are stored in hot areas exposed to the sun. All plastics are derived from petrochemicals, byproducts of the petroleum industry. Many petrochemicals like Phthalates and BPA are among the cancer-causing chemicals known to be present in foods and beverages stored in plastics. Bottle alkaline water can absorb these petrochemicals. So, when you consume the liquid, you may also consume the chemicals. They disrupt the body’s endocrine system, interfering with the natural production of hormones. This can increase a person’s risk of cancer. If you desire to drink clean alkaline water you want to do so because you’re aware of the toxins and chemicals in both tap water and bottled water, right? Putting alkaline water in toxic plastic bottles defeats the purpose of drinking healthy alkaline water. Second, alkaline ionized water is beneficial because of its ORP (Oxidation Reduction Potential) that makes it an antioxidant and its alkalinity (High pH-balance). The antioxidant (the lower the ORP, the better) last approximately 18-24 hours. The Higher pH will last approximately 1-2 weeks. The smaller molecule cluster size of its water will last approximately 1-3 months. So you see, bottling alkaline water makes no sense, because the antioxidant power is gone after 24 hours. The High pH after two weeks. Some bottled water makers put an expiration date on their bottled water and bottles. Even if they would store alkaline water in glass bottles, it doesn’t matter because alkaline water doesn’t benefit you unless you drink it within the time frame stated above. For best results for your health, avoid bottled alkaline water and drink your alkaline ionized water immediately after you pour it from your own alkaline water machine. Cheers. Fill your own non-toxic bottles with ionized alkaline water, and take it anywhere; to work, to parties. Safely bottle your alkaline ionized water in a glass bottle. This NEW Alkaviva UltraWater filter ionizes, alkalizes and mineralizes drinking water any where and at any time — Just Plug It In! 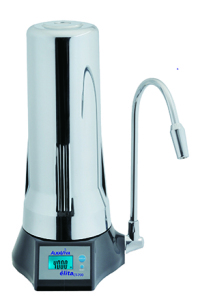 The Elita CT 700 UltraWater Counter Top Filter is a Green, Eco-friendly Alkaline Water Filter! No chemicals leaching into your water from harmful plastics. Elita is made from safe, stable, BPA-free material (LDPE #4), and NSF certified materials. The filter uses an absolute minimal amount of plastic and can be recycled. How long can alkaline water be kept. Why I said that because I have a portable alkaline stick that can ionised water between 7.8 to 9 ph. I usually keep the water with the stick in a BPA free bottle over night before transferring the ioniszed water only to another bottle. Question : Can the transferred water be kept ionised or the alkalinity of the water say for more that 8hr. Alkaline water sticks only raise pH. No electrolysis takes place and therefore no ionization. If there’s no ionization, there’s no Oxidation reduction potential (negative ORP) which gives it its anti-oxidant benefits. What alkaline sticks do provide is a high pH, which last about 2 weeks. was being pitched. As I was skeptical, I checked with you. Thanks for the information! Thanks John, Glad this was helpful to you. Depending how long the water’s been on the store shelf, it probably lost it antioxidant potential. If the ionized alkaline water is made right at your purchase, you should drink it within 24 hrs to enjoy your investment. Of course the water is still good to drink, but it wouldn’t be alkaline, ionized water after 24hrs. The antioxidant (the lower the ORP, the better) last approximately 18-24 hours. The Higher pH will last approximately 1-2 weeks. The smaller molecule cluster size of its water will last approximately 1-3 months. So you see, bottling alkaline water makes no sense, because the antioxidant power is gone after 24 hours. The High pH after two weeks. We have been using Nestle Water in bottles, than refill them from our tap water, which we were filtering with Brita Water filters and we reuse those bottles 4-5 times, than recyle. However, now we are wishing to switch to complete alkaline water and have friends with a Santivia Water Filter system that uses rocks and the filter needs to be replaced after a while. Is this alkaline water better or it is better to have this machine …. there are a few on the market and we need more information. Hope you can shed some light on the brands, the best options and I understand that as a company you would need to represent your own brand, but I respect the information that I have gathered on your site and feel more informed and would be greatly appreciated to help us move to better choice. I know there are a few questions and concerns and hope you can be helpful. Much appreciated! Hi Julie, I understand your request wanted to learn more about water filtration and which options for ionized alkaline water would be best for you. I will give some links to follow as much of your questions will answered in them. Alkaline Water can be achieved by adding minerals in the filtration process, which gives it a higher pH. pH and negative ORP are pretty easy to produce. All one has to do is add alkalizing minerals to the filter, which is what Vitev has done. In fact, all alkaline water pitchers do that. What’s worse is that these water pitchers don’t clean the water effectively, because they only use a carbon medium to filter the water, which only adds better taste. So you will be drinking good tasting dirty alkaline water. Our UltraWater alkaline filter is MADE IN THE USA and Patent-pending. The fact is, there are no other products like Alkaviva UltraWater filters and Water Ionizers. What is the difference between the elita 700 and the more expensive models ( besides the price). My dad now has secondary cancer and I want him to have the best chance in fighting back naturally. I’m aware of plastic leaching and want to know if there’s an appliance to filter out the harmful chemicals from the tap water and alkalize the ph level that doesn’t have any harmful chemicals in the container itself.